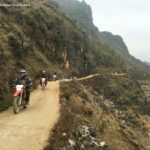 This 5 day Motorbike tour from Saigon is one of the best short motorbike tours in Vietnam made by our local team in southern Vietnam. with only 5 days, you can have chance to see the different Vietnam and be faraway from the hustle of Ho Chi Minh city. 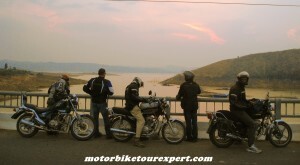 Besides, it offers some great motorbike ride on coastal roads in the 5th day. Day 1: Saigon Motorbike ride to Dong Xoai – 110 Km. Start the Saigon motorbike tour at 9 AM from the centre of Ho Chi Minh city. We will be at Cu Chi tunnel after around 2 hour motorbike ride through Ho Chi Minh city, spend around 2 hours to discover the tunnel and learn more about the history of Vietnam War. 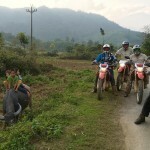 After lunch, we keep riding through some large rubber tree garden to Dong Xoai town where the Ho Chi MInh trail end in the south of Vietnam. Dinner and overnight in Hotel in Dong Xoai. Keep motorcycle touring on Ho Chi Minh trail and stop more at the villages of hill tribe (M’nong, Ba Na people). We will pass some beautiful waterfall with a green water pool where we can have great swim. After picnic lunch at one of the waterfall, we motorcycle to the Lak lake – the second largest lake in Vietnam and spend the rest of the day at the lake (swimming or hunting the pictures of sunset). Overnight in a stilt house nearby the lake – Home stay. This is a short motorbike tour to Da Lat but we can have a lot of chances to visit mushroom farm or flower garden, waterfall… short trek to the jungle or cross the lake by boat or by elephant. This is a easy motorbike ride to Nha Trang, most of the ride is on big and smooth road except the small “monkey bridge” just after Da Lat town. We will do some stops to visit King Bao Dai’s palace or peaceful villages of the hill tribe along the way. The 5 Day Saigon motorbike tour to Nha Trang will finish at around 4.30 PM in Nha Trang city after saying good bye to the staff of Vietnam Motorbike Tour Expert you can enjoy your free relaxing time at one of the most beautiful beach in the world before flying back home or back to Ho Chi Minh city. Please view the route here!